The SRI-led Trauma Pod, developed for DARPA as a next-generation mobile robotic surgery platform for the military. Credit: SRI International via Wikimedia Commons. This week, the “144” study on adverse events in robotic surgery made the rounds in media outlets such as the BBC, NBC and the MIT Tech review. An impressive group of researchers found that between January 2000 and December 2013, we have records of robotic surgical procedures killing 144 people, injuring 1,391, and involving 8,061 malfunctions – this is out of a total of more than 1.7 million procedures performed in that time period. This is of course serious news, raises important questions, and adds to a heated conversation on the safety and effectiveness of robotic surgical procedures. A growing body of studies now argue these points (for example [1, 2, 3, 4]), and thankfully we’re starting to learn when and why this technology works or causes trouble. A lot seems to come down to how frequently a procedure is performed at a particular hospital and by a particular surgeon, for example. Hopefully this dialogue will mean safer and more effective robotic procedures as the years go on; this is generally the story with surgical technologies as they mature. The intense focus on safety and effectiveness seems to be compromising training for new robotic surgeons. It may also mean many fewer competent robotic surgeons, just as demand for robotic surgery soars. After two years of field research – observing close to a thousand hours of robotic and open surgery at five diverse hospitals and interviewing surgeons and residents from ten teaching hospitals around the country – I have found that the intense focus on safety and effectiveness seems to be compromising training for new robotic surgeons. I should say from the outset that I’ve collected data only on surgery involving Intuitive’s da Vinci system, and primarily on urologic procedures. I did this to uncover best practice: the da Vinci is used far more frequently than any other robotic surgical system, and the field of urology has had – by far – the most experience with the system over the longest period of time. Most often, residents watch robotic surgical procedures unfold on TV screens in the operating room, which likely has limited learning. This challenge adds fuel to a fire that was already burning: according to the AAMC, surgical demand is growing significantly faster than the supply of surgeons. The significant reduction in medical residents’ work weeks (from 120 hours to 80, mandated by the AAMC) has also decreased the number of surgeries that remaining medical residents get to perform. So “best practice” with the da Vinci has – on one key dimension – made it even harder for many students to get sufficient, safe, legitimate opportunities to learn how to use it. So what are we to do about this problem? It looks as if every way forward involves challenging deeply held norms, laws and techniques related to surgical work. Change will likely require effort on multiple fronts simultaneously. It’s tempting to suggest that senior robotic surgeons should allow medical residents ten times the opportunity to struggle on their own during surgery… until you watch an expert remove potentially cancerous lymph nodes in ten minutes and on a different day watch a resident struggle to do the same in forty. Some surgeons allow this, but because of the legal, professional and quality assurance issues described above, many expert robotic surgeons won’t. Robotic surgery will likely continue to expand in proportion to other methods, given that it allows fewer surgeons to perform surgery with less trauma to the patient. One interesting option is to do nothing, because surgery itself is on the wane. A good number of the senior surgeons I speak with presume that new treatments – nanoparticles, nanobots and the like – will make cutting into patients less and less necessary. But many physicians and researchers expect that surgery isn’t going away for at least several decades, and that if anything, robotic surgery is going to continue to expand in proportion to other methods, given that it allows fewer surgeons to perform surgery with less trauma to the patient. 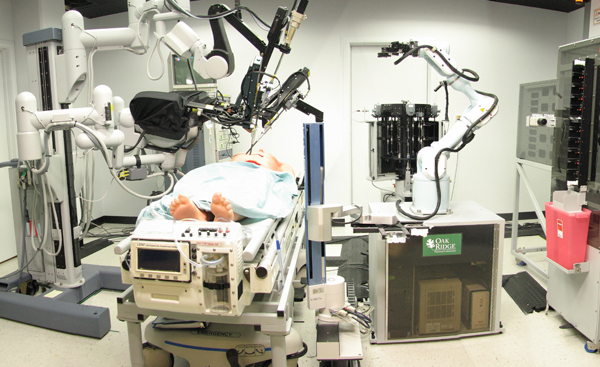 We have recently seen striking progress on automating surgical tasks in lab settings. When I ask experienced robotic surgeons about the future of their work, many of them suggest that relatively routine portions of a given procedure might soon be automated. The system might move more slowly than they would, and the surgeon might need to orient the system to the landscape inside the patient, but a semi-autonomous system would allow a single surgeon to perform several procedures simultaneously. But while this solution could address the demand side of the equation, it’s not obvious how it would help surgeons in training. Trainees in surgery are still expected to build embodied competence through “live” work. Simulation has already played an important role in resident education – Intuitive has partnered with a number of organizations to produce relatively advanced software simulations that help build basic surgical competence. The trouble here is that – unlike most highly skilled, collective work such as sports, music or law enforcement – trainees in surgery are still expected to build embodied competence through “live” work. In order to get time on the simulator, residents at most institutions have to get less sleep or time with family – in other words, surgical education doesn’t build in sufficient time for offline practice. This changed in the field of aviation so it seems possible in the field of surgery, despite a strong norm for learning in live procedures. A final option is telesurgery: if surgeons could operate on patients remotely, we could more efficiently deploy surgical expertise across geographically distributed demand. The original DARPA grant that contributed to the development of the da Vinci specified remote surgery on wounded soldiers as a key use case. Legal, regulatory and team-dynamics barriers loom large here. As of now, law and regulation make it difficult (often impossible) for physicians to do remote diagnosis and recommend treatment – let alone operate on a patient – across state lines in the US. Also, we have decades of research showing that geographically distributed teams underperform relative to their collocated counterparts. We should be wary of a surgeon in California trying to coordinate a surgery with a nurse and a surgical scrub at the bedside in Atlanta. No matter how safe we make robotic surgical procedures, they will become a luxury available to a very few if we fail to address the sustainability of the practice. Some hybrid of the options above on a large scale will likely be required to address the constraints that “best practice” with these systems places on surgical training. Bringing this lens to the next wave of development in surgical technology – such as Google’s joint venture on robotic surgery with Johnson & Johnson – shouldn’t take much additional effort, and could extend the benefits of minimally invasive surgery to many more at decreased cost. Agarwal, Piyush K., Jesse Sammon, Akshay Bhandari, Ali Dabaja, Mireya Diaz, Stacey Dusik-Fenton, Ramgopal Satyanarayana, Andrea Simone, Quoc-Dien Trinh, and Brad Baize. 2011. “Safety Profile of Robot-Assisted Radical Prostatectomy: A Standardized Report of Complications in 3317 Patients.” European Urology 59 (5): 684–98. Chang, Steven L., Adam S. Kibel, James D. Brooks, and Benjamin I. Chung. 2014. “The Impact of Robotic Surgery on the Surgical Management of Prostate Cancer in the USA.” BJU International, September, n/a – n/a. doi:10.1111/bju.12850. Sammon, Jesse D., Firas Abdollah, Dane E. Klett, Daniel Pucheril, Akshay Sood, Quoc-Dien Trinh, and Mani Menon. 2015. “The Diminishing Returns of Robotic Diffusion: Complications Following Robot-Assisted Radical Prostatectomy.” BJU International, March, n/a – n/a. doi:10.1111/bju.13111. Trinh, Quoc-Dien, Jesse Sammon, Maxine Sun, Praful Ravi, Khurshid R Ghani, Marco Bianchi, Wooju Jeong, et al. 2012. “Perioperative Outcomes of Robot-Assisted Radical Prostatectomy Compared with Open Radical Prostatectomy: Results from the Nationwide Inpatient Sample.” European Urology 61 (4): 679–85. doi:10.1016/j.eururo.2011.12.027.